TB Awareness Activity at Urdu Middle School Khajrana – 24th January 2019. #tbfreeindia. CETI Team conducted a TB Awareness Activity for the Students and Staff of Government Hindi Middle School Kulkarni ka bhatta Indore. CETI Team educated them about Tuberculosis and Tobacco, its symptoms and how a TB patient can benefit from getting free treatment facility. TB Awareness Activity at Global Higher Secondary School – 21st January 2019. #tbfreeindia. CETI Team conducted a TB Awareness Activity for the Students and Staff of Global Higher Secondary School, Rajiv Nagar Indore. CETI Team educated them about Tuberculosis, Its symptoms and how a TB patient can benefit from free treatment facility. TB Awareness Activity at Anganwadi Khajrana Indore – 21st January 2019. #tbfreeindia. CETI and Team had conducted a TB Awareness Activity at Anganwadi, Rajiv Nagar Khajrana, Indore. They educated the Anganwadi Women’s and Supervisor’s about Tuberculosis. What is TB?, its symptoms and its free treatment. Indore Newspaper Clippings – 5th – 7th January 2019. #tbfreeindia. 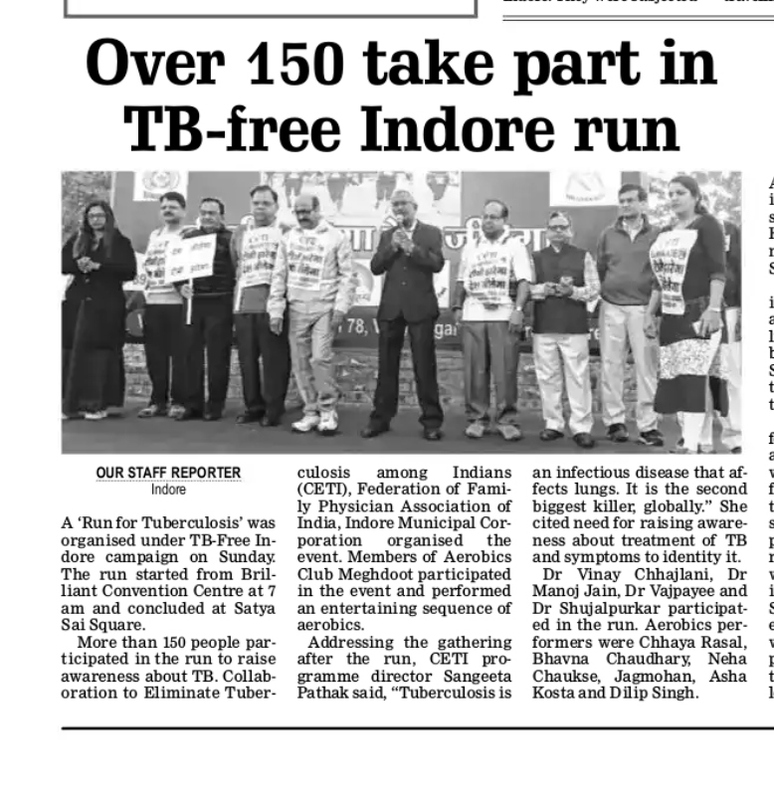 A Run for TB was organised under TB free Indore Campaign on Sunday – 6th January 2019. #tbfreeindia. 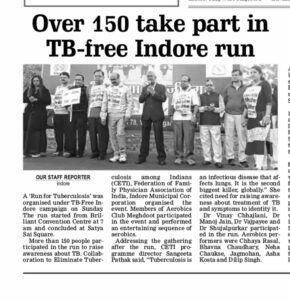 A Run for TB was organised under TB free Indore Campaign by Federation of Family Physician Association of India, CETI , RNTCP, Indore Municipal Corporation, Soni Jain Trust, Gyanpushp at Brilliant Convention (Nakshatra) 78, Vijay Nagar Indore. The Run started from Brilliant Convention Centre to Satya sai square and Satya sai square to Brilliant Convention, more than 150 people participated in the run to raise Awareness about TB. Dr. Vijay Chhajlani (DTO), Dr. Manoj Jain (Co- Chair CETI), Dr. Vajpayee (President of FFPAI) Inaugurated the Event. TB Awareness Activity At AL- Falah Public School Khajrana Indore- 5th January 2019. #tbfreeindia. CETI and Team had conducted a TB Awareness Activity at Al- Falah Public School Khajrana Indore . They educated the students and school staff about TB and Tobacco, what is TB ? , its symptoms and its free treatment. (Mumbai, India: December 31st, 2018) Tuberculosis (TB) is one of the top 10 causes of death and the leading cause from a single infectious agent across the globe. Millions of people continue to fall sick with TB each year. Of the 10 million new cases of persons diagnosed with Tuberculosis in 2017, India ranked the highest accounting for over one fourth (2.74 million) cases were from India, according to a rep by WHO. Though the report underlined fears of under-reporting of cases in India, it also mentioned that India was an example of a country that took major steps in 2017-18 to expand TB-specific cash transfers and linkages to broader nutrition schemes to improve treatment outcome……..Read More. TB Awareness Activity at Govt. Hindi Middle School(Kulkarni ka Bhatta) – 21st December 2018. #tbfreeindia. CETI and Team had conducted a TB Awareness activity at Government Hindi Middle School Kulkarni ka bhatta Indore. TB free Gujarat Campaign was Launched on 21st December 2018, at Vadodara Gujarat. Newspaper Clippings – 18th December 2018. #tbfreeindia. Your ticket for the: Newspaper Clippings – 18th December 2018. #tbfreeindia.